Help Save America’s Last Wild Horses! Did you know that wild horses used to roam freely in the San Francisco East Bay? Paleontologists found indigenous wild horse fossils in the Caldecott Tunnel when they were digging the 4th bore. Those wild horses disappeared. Right now the last of America’s wild horses are being managed to extinction. The truth is they are severely underpopulated on public land. There is no head count! Only fake “estimates”. Lobbyists are pushing to forcibly drug wild mares with Pesticide PZP, made from slaughterhouse pig ovaries for population control with YOUR tax dollars. Lobbyists call it a “vaccine” as if fertility were a disease when it’s key to species survival. The National Academy of Science reported there is “no evidence” of overpopulation. No evidence. Guess what? 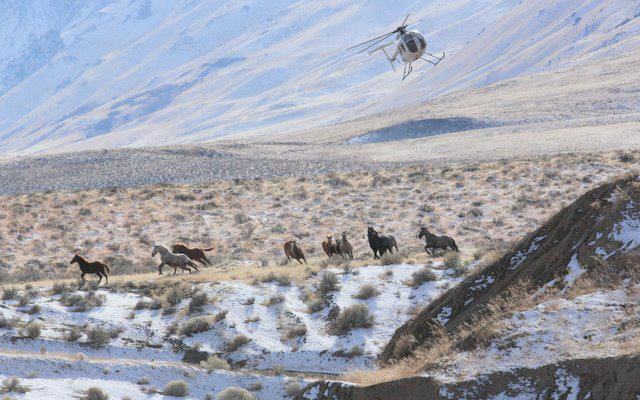 PZP Pesticide sterilizes wild mares after multiple use. The lobbyists think each mare should contribute “only one foal” to the last remaining wild herds. This is nuts and goes against Nature and survival of the fittest. Together we can save America’s wild horses before it’s too late! The Bureau of Land Management (BoLM) is flooding the internet with mustangs. They are pumping America’s wild horses through their internet adoptions so BoLM can strike them out and strip them of their federal protections after only 3 failed adoptions. After 3-Strikes they can become sale eligible, like Henry,. and lose their federal protections due to a loophole created by the Burns Amendment to the 1971 wild horses and burro protection act. It doesn’t mean they are some sort of rank mustang that nobody wants. The 3-Strikes policy is all about creating a category for disposal. Captured as a yearling in 2011, Henry has lived most of his life in the shelterless pens with distant memories of his mama and herd in the wild. . .
Poor Henry has 3-Strikes now because he wasn’t picked like all the flashy wild horses who were adopted. He’s plain but he’s sweet and just wants to be loved. Henry is so lonely and so scared. Please help Henry #9847 find a forever home! Tag-#9847. 6 year-old bay gelding gathered from the Goshute Herd Management Area in Nevada in February of 2011. This wild horse is available for sale or adoption with bids staring at $25.00. At the conclusion of the bidding, the successful bidder will inform the BLM if they are purchasing or adopting the animal. If the animal is purchased, not adopted, the successful bidder receives bill of sale to the animal upon completion of payment and final paperwork. If the animal is adopted, the minimum bid must be $125, and the animal is not eligible for title until the one year anniversary. Pick up options (by appt): Palomino Valley, NV; Delta, UT; Elm Creek, NE; Pauls Valley, OK. Adoption confirmation for this animal must be finalized, by e-mail to BLM_ES_INET_Adoption@blm.gov Henry is available for in-person walk up adoption/purchase ONLY. Protect Mustangs is an organization who protects and preserves native and wild horses.